Badrinath is believed by Hindus to be one of India's &QUOT;Four Holy Abodes&QUOT;, together with Puri, Ramesvaram, and Dwarka. The Hindu Shastras 1 declare that no pilgrimage would be complete without a visit to Badrinath, which Hindus believe to be the abode of Vishnu. (Vishnu is the &QUOT;preserver&QUOT; in a triad of the Hindu pantheon's chiefest gods, together with Brahma, the &QUOT;creator&QUOT; and Siva, the &QUOT;destroyer/preserver&QUOT;.) The word badri is derived from the name of a wild fruit that Vishnu is said to have lived upon while doing penance at Badrivan, an area which includes all five of the most significant temples in the region surrounding Badrinath. 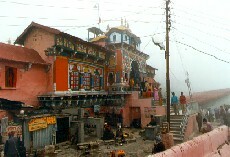 Kedarnath, associated with Siva, is another of these five mandirs (temples). Sankaracharya 2, a monist philosopher from Kerala in South India, is attributed with establishing the four great pilgrimage centres (&QUOT;The Four Holy Abodes&QUOT;) in the early ninth century A.D.
Badrinath is typically &QUOT;snowed-in&QUOT; throughout the winter, being open from (approximately) late April until November. Badrinath, due primarily to its aforementioned religious significance, attracts many visitors each year, some of them Hindu pilgrims coming from afar (including the aged), desiring to do puja (worship) in this &QUOT;Holy Abode&QUOT; of Vishnu before their death, or better in their mind, to die there. Badrinath has been accessable by a motorable road for only a relatively brief period (some 15 years or so, if our memory is serving us well). Before the construction of the roadway, pilgrims, even those advanced in years and in ill health, forged their way up to Badrinath across a decidedly rugged (albeit beautiful) terrain. We have heard it said that some of these devotees of Vishnu died en route. Near the colourful temple in Badrinath, and below it, are steamy bathing pools, fed by suphurous hot springs believed to be inhabited by Agni (The Hindu god of fire). Agni is believed to reside there by the kindly admission of Vishnu. Visiting pilgrims often bathe themselves in these hot pools in conjuction with their worship at the temple.